Playgroups are a good opportunity to get out of the house and meet other mums. There are playgroups on throughout the week in Kingston. Here is our pick of the best groups on offer. This group is friendly with a relaxing environment which is Secure and safe and runs through school holidays. This group is suitable for babies to pre-schoolers. 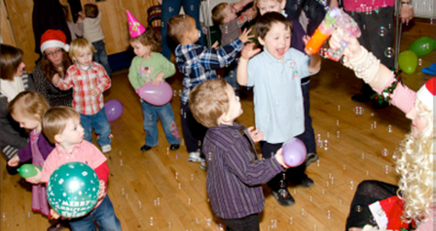 Welcare house, 53-55 Canbury Park road, Kingston Upon Thames KT2 6LQThis group is friendly with a relaxing environment, suitable for babies and toddlers accompanied by their parent.�Indoor and outdoor play space, offering a variety of activities and toys. Informal coffee morning for local mums and mums-to-be held on the first Thursday of every month from 10:30 to 12:30. Everyone welcome. Simply turn up on the day. Aims to be a friendly and welcoming Toddler Group for all carers and their little ones in Kingston. Each week will include lots of play, a craft activity, snack time and a session on our 'multi-level soft play area' while the adults have coffee. We are open every Thursday in Term time between 10am and 11.30. Drop In Play Session for pregnant Mums and families with babies up to 15 months. Multiple Births Support Group for families with twins or more aged 0-5. Welcoming easy pop in and free event. Limited places available. Arrive early to avoid disappointment. Kingston Library brings Rhyme Time to the Culture Caf�. Rhyme and Storytime for babies, toddlers and under-fives with stories, rhymes, simple craft and toys. Due to the overwhelming popularity of the Kingston Library service Rhyme Time sessions at the Rose Theatre on Monday mornings, the numbers attending the sessions will have to be limited in order that licencing and safety requirements are not compromised. Places will be allocated on a first come first served basis. Monday afternoons from 3:00pm to 4:30pm during term times. A fun session for 0-5s messy play, outdoor activities fun and learning for children and parents, need to book month in advance.Stay and Play sessions for parents and children 0-5 singing, activities and a freindly welcome. Please ring to book. Soft play session called "The Pop", contact centre for details. The Saturday Club is a group for one parent families to chat, make friends, network and offer practical and emotional support. 1.30-3pm, every fortnight on a Saturday. Each week there is a different craft activity for parents/carers to do with their child(ren). There are also free play opportunities with toys, puzzles, books and sometimes play dough, painting or music as well.Every Wednesday morning 9.30am-11:30am during term-time.